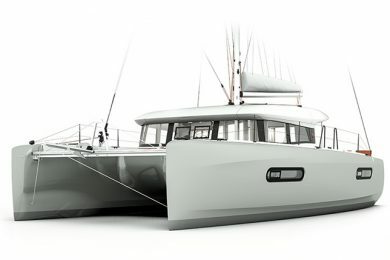 Imagine yourself on board a massive 100-foot trimaran. You are alone, sailing through the Southern Ocean in an attempt to break the single-handed, non-stop circumnavigation record. It’s just before dawn and the visibility is terrible. Your boat speed is sitting nicely in the low 30-knot range when suddenly your radar picks up a mass directly ahead of you. You are sailing well below the northern limit for icebergs and chances are what you are looking at on your radar screen is an iceberg. To make matters worse you are closing fast. You need to gybe in order to pass to windward of the berg. You know that you always have to pass to windward because the growlers, or bergy bits as they are sometimes called, break from the main iceberg and drift off to leeward. What do you do? 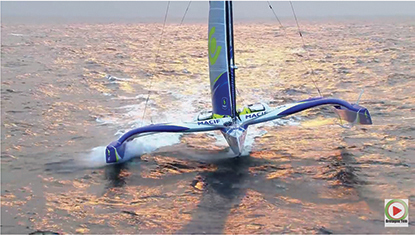 That is precisely what happened to French sailor François Gabart while he was on his record breaking lap of the planet. 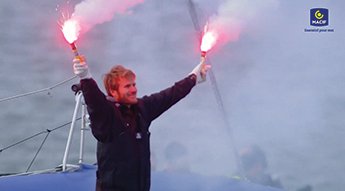 Gabart did what he had been doing since setting off from France a few weeks earlier. 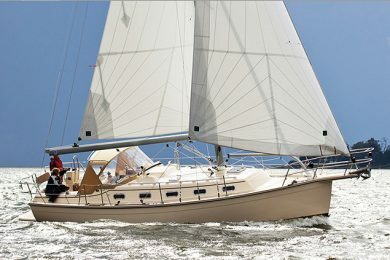 With a cool head he rolled his jib away and gybed his massive mainsail. He then pulled out his video camera and shot a short video of the iceberg as he passed by safely to windward. It was just another day in what became an extraordinary set of days strung together that allowed Gabart to not only break, but shatter the existing record. 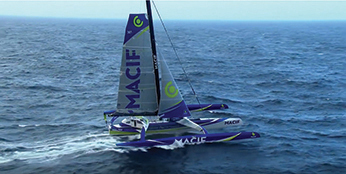 François Gabart aboard his Ultime trimaran MACIF knocked a full six days of the previous record and set a new record time for a solo, non-stop circumnavigation of 42 days, 16 hours, 40 minutes and 35 seconds. François Gabart was racing against a reference time set by his fellow Frenchman Thomas Coville who is one of the world’s best, if not the best solo, offshore sailor. He has seven circumnavigations under his belt. He sailed a flawless circumnavigation to gain the record and the wind gods dealt him some pretty decent cards along the way. When Coville finished, I was as certain as anyone that his record would stand for a long, long time. It was a superhuman effort and would require a superhuman effort to match or break the record, but Gabart felt that he was up to the task. 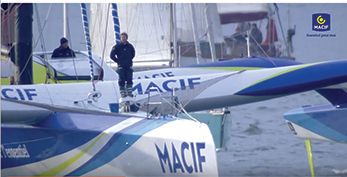 He had already won the grueling Vendée Globe in his IMOCA 60 and had enjoyed some victories aboard MACIF. 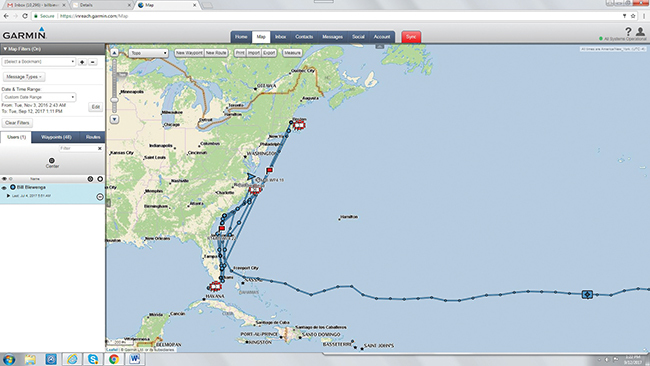 In the summer of 2017 he and a small crew won a transatlantic race from France to New York City. They also won the ArMen Race USHIP, a series of races in Europe. Those events were all part of the shakedown for his new boat and having put MACIF through its paces, Gabart felt that it was time and he was ready to take on Coville’s record. After waiting for a favorable weather window he took off from northern France and was slingshotted out into the Atlantic Ocean and down toward the equator. 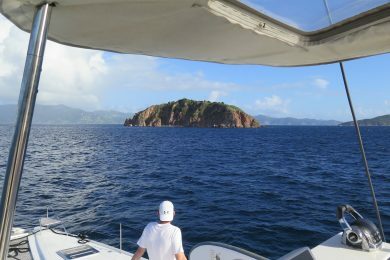 The six days that it took him to cross that imaginary line that separates the North and South Atlantic was fast, but not quite as fast as the pace set by Coville who still holds the record for the fastest single-handed passage from France to the equator. Once across the equator Gabart took advantage of a very nice weather window and turned on the after-burners. The South Atlantic is dominated by a large high-pressure system and in order to get into the deep south you have to skirt the western edge of the high. Cut it too close and you run out of wind. 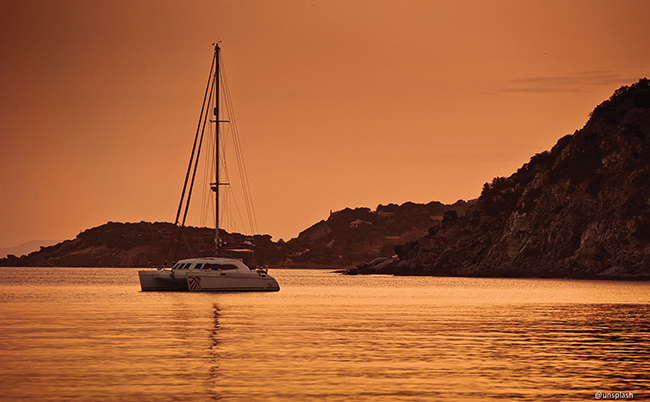 Don’t cut it close enough and you sail extra miles. Luckily for Gabart, as he entered the South Atlantic the high pressure moved closer to Africa meaning that he was able to cut the corner without any fear of running out of breeze. 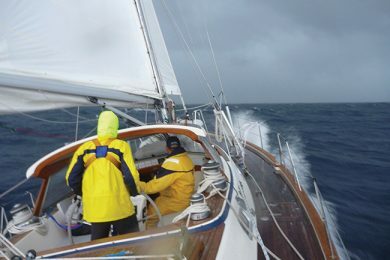 He passed the longitude of Cape Town a full two days ahead of the reference time, but faced a very tricky weather pattern ahead of him. The Southern Ocean is known for a series of cold fronts that circumnavigate Antarctica. 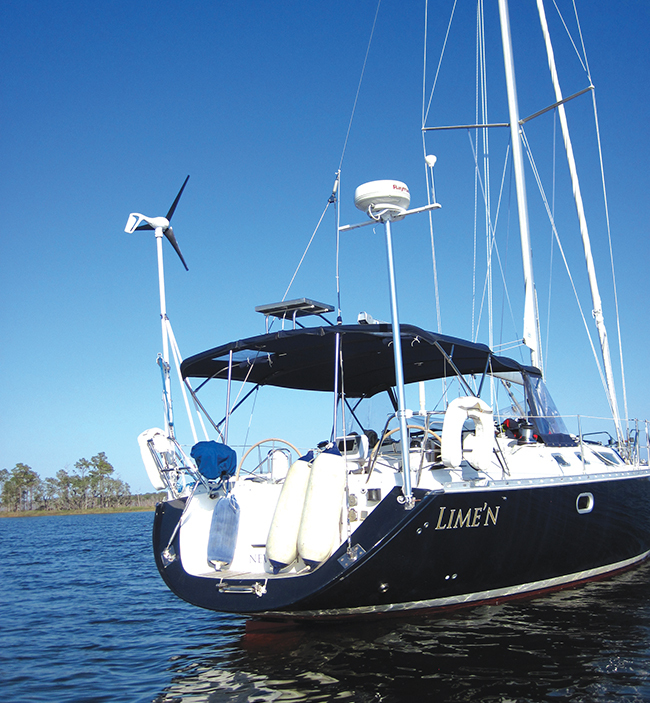 These Ultim trimarans move at such high speeds that, unlike most boats that sail in those waters, they look for the system ahead of them to hook onto, rather than a system approaching from behind. Unfortunately for François, there was an unusual pocket of high pressure directly in his path and in order to get by it he was going to have to dive south to pass under the system. He sailed out of the Roaring Forties into the Furious Fifties and at one point it looked like he was going to enter the Screaming Sixties. He was in dangerous iceberg territory and the detour around the area of high pressure cost him a full day of his lead. When he passed south of Cape Leeuwin on the southwest coast of Australia he was still ahead of the reference time, but the gap had closed considerably. Feeling the need to have some “money in the bank” before turning north after Cape Horn, François pushed his boat as hard as possible and managed to claw back a day so that when he rounded the famous cape at the tip of South America, he again enjoyed a two-day margin on the reference time. In order to get that cushion, Gabart had to push his boat, and himself, to the limits of possibility and endurance. At times his boat speed was in the low 40-knot range and often he was averaging in the mid 30s. His daily runs were consistently over 700 nautical miles, back to back, and he ate up the miles rounding Cape Horn in record time just 29 days after leaving France. While his performance in the Southern Ocean was beyond impressive, the way he ate up the South Atlantic and spat it out the back was unreal. 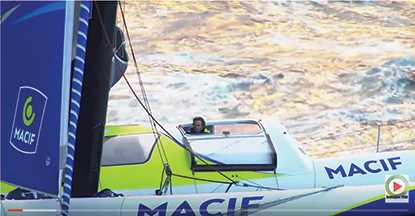 By the time MACIF arrived back at the equator, Gabart was a full five days ahead of the reference time and was showing no signs of slowing down. The problem was that ahead of him the North Atlantic was a minefield. He would have to skirt the Azores High and deal with a series of cold winter gales rolling across the Atlantic toward Europe, but in his usual uncanny way he was able to dodge and duck and keep the boat moving fast. He waited until he was around the latitude of London before turning his bows towards France and the finish. He crossed the imaginary finish line in the early hours of December 17 and sailed into the history books. 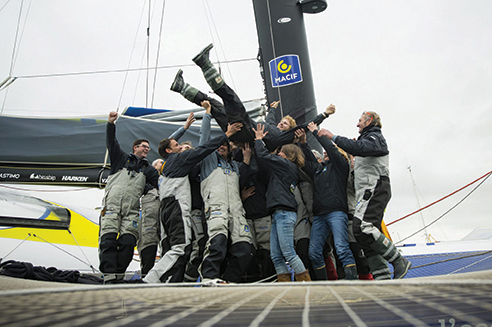 Gabart’s time for the 27,859-mile voyage makes it the second fastest circumnavigation ever. 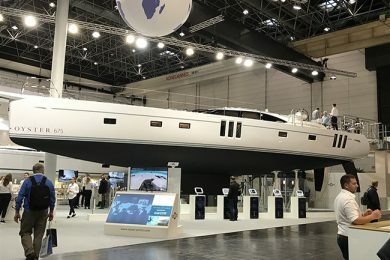 The only team to have lapped the planet faster than him was the legendary Francis Joyon who, along with a five-man crew aboard the giant trimaran IDEC Sport, clocked a time of 40 days 23 hours and 30 minutes. It’s hard to find the words to describe what an enormous accomplishment it was to shatter Coville’s record. MACIF is massive and one can only imagine what it must take to manage the boat, all alone. It is 100 feet long with a beam of 69 feet. 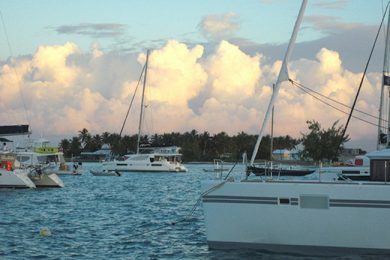 The mast is a towering 115 feet, the mainsail is quite a bit larger than a tennis court, in fact the downwind sail area is the same size and two-and-a-half tennis courts. All of this is managed from a central pod mounted on the main hull. All the lines are led through an array of rope clutches to a bank of winches operated by two grinder pedestals. 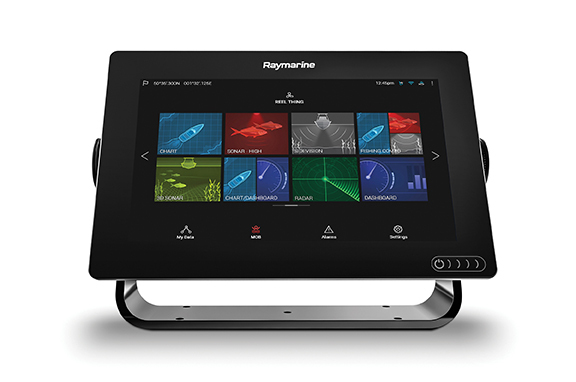 The entire pod can be fully closed off from the weather with the dual steering stations also located within the pod. That does not mean that Gabart is safe from the elements. Much of the time he is sailing with Code 0 like sails that have to be hoisted with a 2:1 halyard. 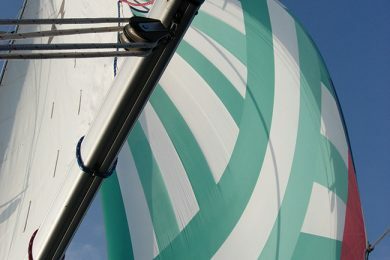 Gabart has to drag this huge sail up from down below, hook up the halyard and grind 230 feet of line until the swivel reaches the top of the mast. 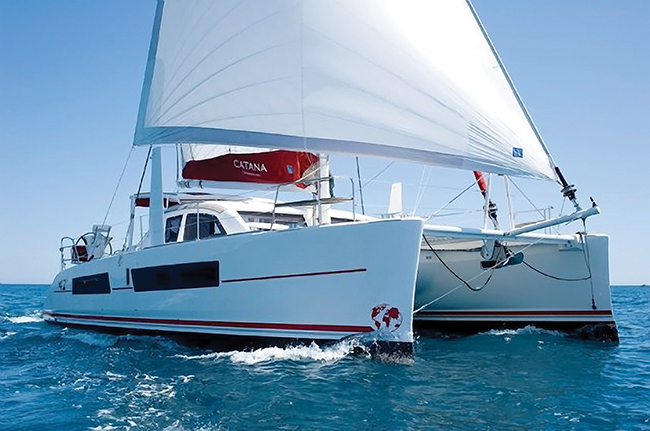 The anti-torque line is stretched bar tight and then the powerful sail, once unfurled, has to be sheeted in. 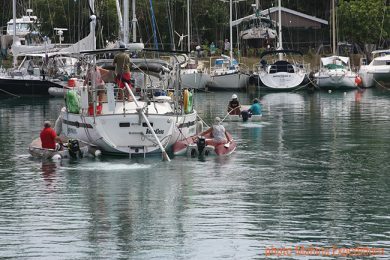 All the while Gabart needs to be trimming the mainsail and dealing with a large traveler that stretches in a semi-circle from one hull, across the transom of the main hull to the other hull. Just winding the traveler up a foot or two must be an exhausting undertaking. One of the luxuries, if you can call it that, is that his routing information was done by an onshore team led by quite possibly the best weather guru on the planet. Jean-Yves Bernot is widely considered the master and it was his job to study the global weather patterns and guide François around and between conflicting weather systems. 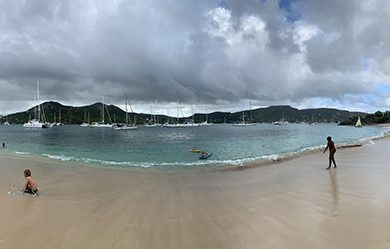 As mentioned before these boats are sailed different from most because they are able to sail at speeds that are faster than the speed that most weather systems move at. It’s a bit like a game of chess studying weather patterns that will occur many days ahead and coming up with a strategy to intersect with a favorable wind pattern that will slingshot the boat toward the next system be it an area of high pressure or low pressure. While it’s not possible to avoid gale force winds, Jean-Yves Bernot tried as much as possible to keep Gabart in a steady 10-15 knot breeze. 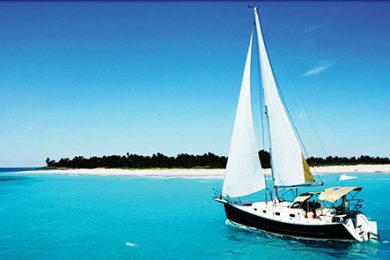 In those conditions the boat can trundle along quite nicely in the low 30-knot range especially if the seas are not too disturbed. At that pace you can eat up quite a few miles and spit them into your wake. 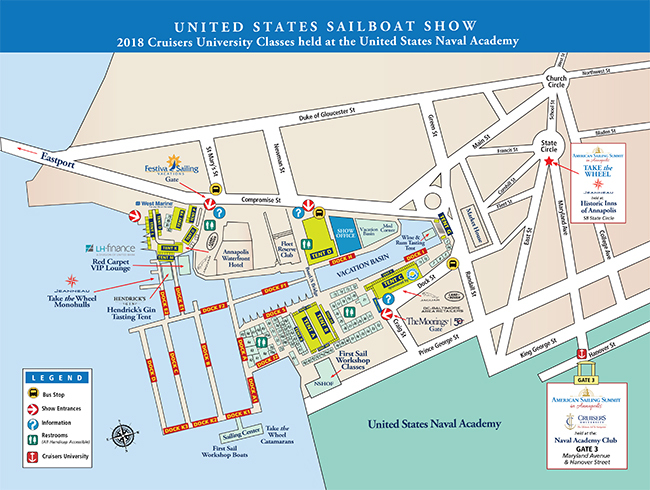 There really are no superlatives in my already superlatives soaked vocabulary that can describe just what an accomplishment this is for a sailor who must now be recognized as one of the best in history. For the six weeks he was out there, Gabart needed to keep himself and his boat together. We all know how things chafe, how things go bump in the night, and how the constant pounding grinds at both man and boat. He managed it all and he even managed to make it look effortless. 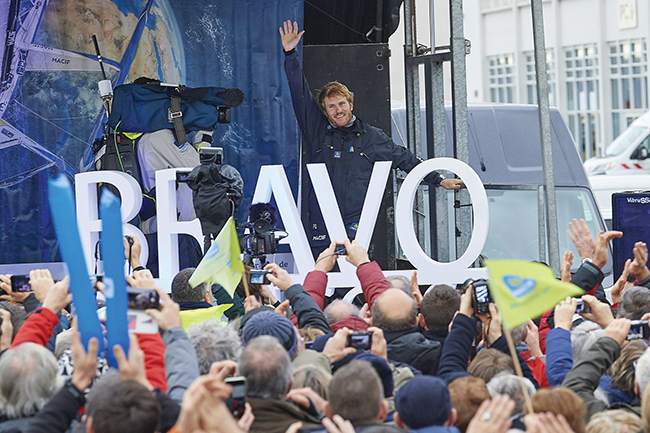 When François Gabart sailed back into his home harbor of Port-la-Foret it looked like he had just been out for a quick spin around the Bay of Brittany rather than a fast sprint around the world. Circumnavigator, sailmaker and raconteur, Brian Hancock follows the hairy leading edge of offshore sailing closely with a combination of vast experience and consummate wit. He lives and develops sails and sail programs for all types of sailors in Marblehead, MA.